Lately, I've been watching through a bizarre TV show from the 80s and 90s called Murder, She Wrote, starring Angela Lansbury. Ostensibly, it's a show about a mystery novelist named Jessica Fletcher who travels around the world solving murders, as well as those that take place in her own sordid village of Cabot Cove, Maine. The wrong person is always fingered for the crime, often one of Jessica's relatives, and it is up to her to find out the true culprit. But beneath the surface, it is a story of a demented and manipulative serial killer. No one ever pieces together the fact that no matter where this woman travels, someone dies. No suspicion ever falls upon Jessica, but instead upon her friends and relatives who she sets up to take the fall for her crimes. She then "rescues" them by redirecting blame to someone else, thus destroying the lives of her family members while becoming their hero; she simultaneously weakens them and draws them under her control and in her debt. It is a subtle, thoughtful social critique on American culture. Even in the final episode, Jessica Fletcher's true nature is never revealed. It is up to the viewer to discern the madness that lays within her lifestyle. On the surface, she is an ordinary small town widow who tends to the garden, enjoys tea with friends, and writes banal novels. But beneath the veneer of this everyman (or woman) lies the heart of demented sociopath. What were the writers, I wonder, trying to say about our ordinary lives and the secrets that we keep? So check out Murder, She Wrote. But don't watch it just before going to bed. Finally, someone else sees the truth! Murder, She Wrote is just an excuse to watch the incomparable Angela Lansbury. You can never get enough Angela Lansbury. Sometimes, that big brain of yours, comes up with things that us normal folks would never imagine. When are they awarding you your nobel prize? Hey John, get a life. Don't we have other things to worry about than some TV show from 25 years ago? It was all fiction anyway. No one who saw her in the original Manchurian Candidate would be surprised. 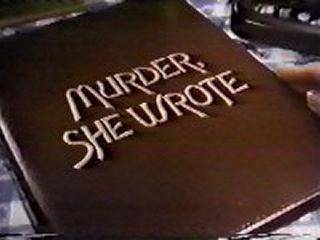 Ah, so Murder She Wrote is a precursor to Dexter. And Harp1034, if that is your real name, who said he was worried? Y'know, this is just like those American Express travelers' checque commercials. How come Karl Malden is always around when somebody's checques go missing? The books are just as good!!! and very portable. Actually, a question: Is "Murder, She Wrote" still boradcast on TV? What channel? We are on Dish Net and it used to be on the Hallmark Channel. It was replaced by Golden Girls re-runs!!!! Bummer. If anyone knows who is showing Murder shows, let me know please. Also Perry Mason re-runs. I really miss then!